January 20th 2014 marked a significant date for engineers and scientists alike as news arrived of the successful reawakening of the Rosetta space probe. The spacecraft, which had been in deep space hibernation for 31 months, will now continue its primary mission to chase and rendezvous with 67P/Churyumov-Gerasimenko; a 2.5 mile wide comet captured by the gravity of Jupiter. Following a tense 45 minutes wait, Rosetta beamed the words “Hello world” to scientists at the European Space Agency (ESA) confirming the probe’s instruments had successfully restarted and indicating that a major stage of the overall mission had been a resounding success. The mission is of particular interest for engineers at Reliance Precision who manufactured gears for Norwegian company KONGSBERG for use on Rosetta. The gears play a vital role in rotating the two 15 metre solar panels, enabling them to perpetually face the sun: a crucial function given that Rosetta has no internal batteries and relies entirely on solar energy for electricity. The team at Reliance is thrilled to be contributing to such a prestigious project: there is something both satisfying and humbling about knowing our components are not only performing perfectly, but in deep space at a distance of around 500 million miles from our works here in Huddersfield. Having been travelling for 10 years Rosetta will engage with the comet in August and commence mapping and characterisation of the comet’s surface. This is partly in preparation for the November launch of ‘Philae’; a separate landing probe designed to analyse water and other chemicals present on the icy rock. The mission is groundbreaking in that a spacecraft has never come into such close proximity with a comet, let alone deploy a landing vessel. 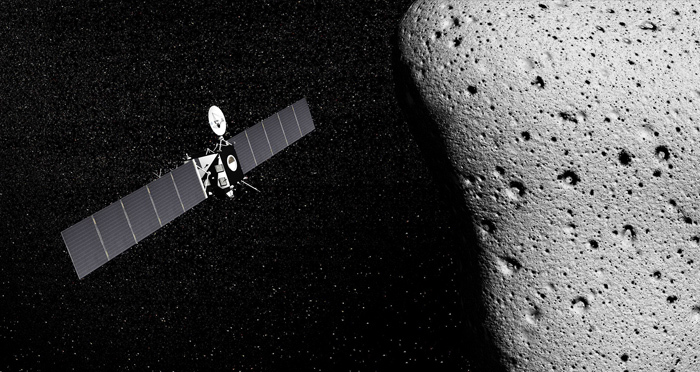 In conjunction with Philae, Rosetta will continue to orbit and gather data and information for up to one year. Comets are thought to be debris that predates our solar system and scientists believe studying them could help expand our knowledge of the universe.